A player from Swindon's academy tweeted that he has joined Southampton today, perhaps this is the player having a medical today as mentioned by K Billy? That's got to be a wind up, no-way is that a real name. Tyreke Johnson, who is being touted by many within the Swindon footballing fraternity to have a bright future in the game, showed glimpses of his talent. He went on a surging run and it was his blocked cross that earned the corner that would provide Swindon with their best chance of the half. ......This from a report last year. Check the run on that video at 1:36. Takes it round virtually the whole team before scoring. Left winger for their youth team. Just opened that in a crowded gym. Cheers Timothy. Are you one of those irritating f*cks that hog the bench press or squat rack playing on their phones whilst others are queuing for them? Sounds like a character from Game of Thrones. And just done the same in the eating area at Euston station. Who comes up with these names!? Ever heard of the expression NSFW? The name 'Mugabe' also causes many a sniggér among the mongboard's dimmer members. well that's a fair question,Colin..... but many years ago.... a colleague (who was of Afro-American decent) told me that some parents try to " create " new names for their children, thus avoiding many traditional Caucasian names that are popular in USA and some other countries. Think you'll find that there are quite a lot of " created names " around ......if you look a bit harder. You guys might remember a Johnny Cash song where a guy was named "Sue" to help toughen him up. Perhaps, in that vein, some should call their son T wat?" He was possibly one of the trialists in our recent U-18 pre-season games? Had to dig deep into the archives to find this thread. The kid seems to be doing well for himself - Good to see. Ah yes, watched the game and I noticed him when he came on as sub. Blistering pace, but he seemed to have a bit about him, and some good passing too. I made a mental note to keep an eye open for him. I believe he's sixteen turning 17 soon. At 16 he shows more composure and intelligence on camera than Raheem Sterling. Has anyone seen a Sterling interview? My God – unintelligible. It's like he finds it difficult to talk. Last week he said this: "I get quite a bit of chances". Got a goal & an assist in a 3-0 win earlier today. We're pleased to announce that youngster Tyreke Johnson has signed his first professional contract with #SaintsFC. Oldest looking 17 year old in history!! I thought something very similar! Excellent news... got a feeling this kid is going to make it. He looks like a 36 year old insurance salesman. Halifax Man has a rightful heir. As does the ever youthful Nwa nkwo Kanu. Can't let today pass without mentioning this lad. Well played for getting his first Prem appearance. Must have impressed Ralph in training. Interesting that it was him rather than the vastly more experienced Ward Prowse that came on. Pleased for the lad, and for the rest of the youngsters who must now think they finally have a chance of getting in the squad. I presume they get a first team bonus as well. Probably on for his pace and keeping the Arsenal defence on their toes as well. 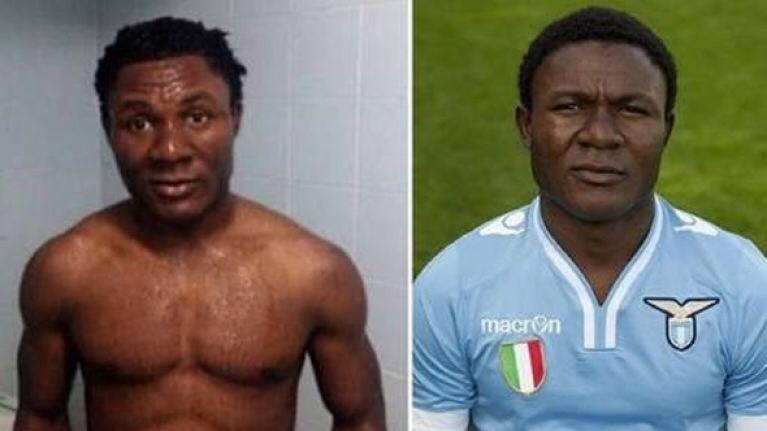 A chance to post a picture of this fella - Joseph Minala at Lazio. I sh 1t you not, he is 17 yo in this photo. Was thinking the same. Congrats to him. See that there are 5 academy players training with the 1st team. Looks like things might be back on track there. Well, Armstrong with his cramp needed replacing, we wanted to run down some time, but your point is valid too. But as somebody else commented why not one of our experienced mid-fielders? A good combination of factors I feel, and having seen a few u23 videos his speed was worth having. Great to see. Don't know much about him. Hope we see Barnes and Slattery get on the bench this season too. With Obafemi around too this is exactly what we should be doing. Really energises things and gives the whole club a boost. Yeah, a massive boost. It filters down through the age groups too as younger players have to step up to higher age groups to cover. Great stuff. Barnes is illegible to play Premier League, I think. I like the time he chose to sub him on. Proper time wasting and proper sh it housery bout time we gave some sh it housery back tbh. Not really, Armstrong could barely walk! Yeah I guess he looked like he was slowing down looking back on it. Couldn't help but think it was some sh it housery at the time though. Either way I'm glad the lad got some game time, even if it was only 5 mins or so.